We need to know who we are fighting, what we’re fighting for and how to fight! If we lack in anything the Lord will provide all we need! He lets us partake of all the good things of his kingdom. 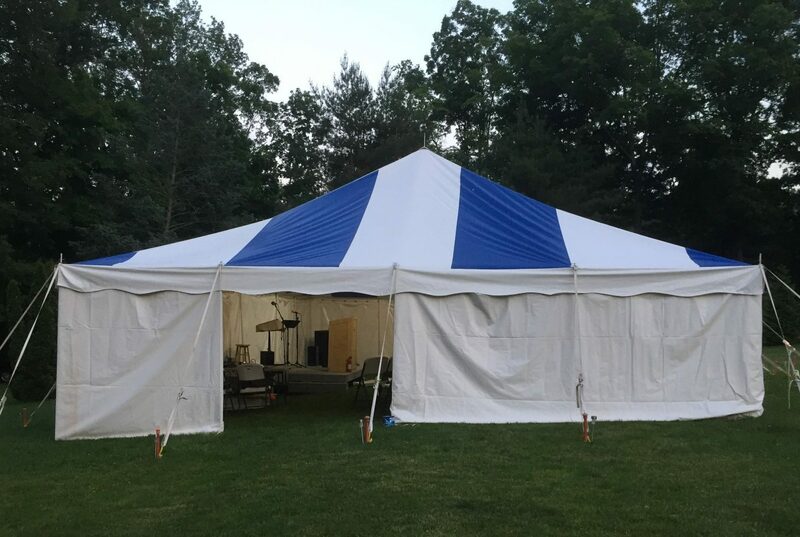 CLICK BELOW TO LISTEN TO AUDIO FROM THE CONNECTICUT TENT REVIVAL FROM June 11th to June 16th, 2018. The Word of God is sharper than any two edged sword, be sure to be armed. The Church of Israel, which were the Jews when Jesus came to earth as a man, rejected Him. Even when nations reject the Lord, God still works in individuals who will believe. There’s no power on this earth that can stand against Gods Word! None! Things that happened in scripture still happen today. The head of the Church is Christ. In six days God created the earth and everything in it, He can do extraordinary things in short periods of time. His ways are higher than our ways! Our ways are wrong. To be in the Lord is talking about a dwelling place. Jesus is seated at the right hand of God the Father, if we are in His body we are also. If we want to see the power of God, we need to be willing to have our backs against the Red Sea with Pharaoh’s Army bearing down on us. The first person to raise someone from the dead was Elijah, many followed after, even unto this day. People don’t know what it is to walk in Christ Jesus, therefore many tragic things happen. We were created in God’s image, three in one. There are three baptisms that agree in one. Our flesh never has any fellowship with God, only our spirit and soul. The spirit is life. In order to keep something alive it must be grafted back into the life source, like a rose to a bush so can we be grafted back into Christ and live through the Spirit. Why do we die? The wages of sin is death. Everyone will die. As a bad apple will ruin the whole lot of good apples, so will our flesh do to our soul, as long as we are subject to it. The kingdom of God is the spiritual realm where God dwells. In it there is healing and deliverance, in the kingdom of the world there’s sickness and death. When we receive the Gospel we have to recognize we are sinners in need of a Savior. Jesus came to save sinners. God is love, when we’ve been forgiven much, we’re more apt to love much. The only blood that can save is the blood of Jesus! Jesus’ natural father is the Holy Ghost. The only difference between us and Jesus when He was here as a man, is that His body was sinless. Christ became a cursed thing for us, when He got up on the cross and took all the sin of the world upon Himself. When we are dwelling in Christ, the devil sees Christ. Live for Christ rather than to please everyone around you. We don’t have to change our old man, we need to walk after the spirit. When we walk in the baptism then we can walk in the Kingdom of God. Everything in our life should begin with prayer, we need someone bigger and better than us, that’s Jesus! We can’t keep doing the same things and hope the world is going to get better. Things are only getting worse and worse at a rapid rate. All the churches today cannot even agree on baptism. You have to show God that you are committed to Him. America is taught not to sacrifice for anything or anyone. We are to love the new man in Christ, not our old man. We all know how everyone should love us, but do we want to love others as Christ does? The churches today try to establish their own righteousness. Even Jesus Himself said He was not good. When you live by faith, you live in Christ Jesus. Because we don’t rightly divide the battle, God cannot honor the things we do. He cannot honor us when we are in error. The leaven of the Pharisees is that we think there’s something of ourselves that we can do to please God! We need to operate in humility knowing we can do nothing without Him. The Church has departed from THE faith. Every individual that is born in this world is walking according to the prince of the power of the air. The Lord has nothing to do with all the wicked going on in this world. Christ’s body is the temple of the Holy Spirit not the flesh. There is no good thing in our flesh as the Apostle Paul said. To be the faithful in Christ Jesus means you walk by faith in Christ doing His works! The old man is trespass and sins. It is our enemy. When Jesus was walking on this earth He was fully man, that’s why He could do nothing of Himself. He did the works of His father by the power of the Holy Spirit. Jesus is the miracle worker, if we are in Him others will see miracles also but it is still Jesus who performs them. It is our nature to make ourselves seem better than another. Put off our mind and put on the mind of Jesus Christ, it will never be reconciled to our carnal mind. Our carnal mind is contrary to Christ’s. There is no difference between any other person and a Christian save Jesus Christ. You cannot be seated in heavenly places with Christ Jesus unless you’ve been born again by the blood, water and the spirit. If we are not seated there we have no fellowship with Christ. That is most people’s relationship with Christ. We need to ask Jesus to come into our hearts and become our Lord (our master) and Savior. We abide in Christ by faith, not by sight. Having faith in the operation of God. The only thing we can do to please Him is to believe Him! Everybody is going to doubt, but you have to choose to doubt your doubts. The new creature was created in Christ to do the things that Christ would have us do. He will provide everything we need to do the things He would have us do. How did the prophets in the Bible accomplish the things given them to do? Only by the power of God! If we aren’t doing what God would have us to do, why would God back us up? Joy and love come from the Lord, we’re not going to have them if we’re fighting against Him. We struggle to love because of pride. He has to command us to love because it’s contrary to our nature. The Word of God will sustain us. His Word is true. Jesus humbled Himself before the Father, He submitted Himself unto Him. There are two rules God has given us, if we follow those two rules we wouldn’t need a civil government. People would rather take their problems to the unbelievers because they are seeking someone to justify them not actually fix the problem rightly. How do we minister the Gospel to others, we have to have a sense of our own wickedness and therefore know the Gospel personally. God has a line of authority, Jesus then apostles, prophets pastors evangelists and teachers. We need to take heed to those whom the Lord has established. In order to partake fully of the grace we have to humble ourselves. This is critical to getting free in Christ, whom the son sets free are free indeed! Christ is not a God of rule books. We are saved by grace, not a rule book. Salvation is entirely the work of God, if any part of it were the part of man, then Christ would not have had to die. The story of Joseph tells that first and foremost Joseph was a servant. He was a servant to Potipher, a servant to the jailer, a servant to Pharoah. We are bought with a price, we call Jesus Lord, which then means we are His servants. Did you ever think that you could have the like, precious faith that the Apostles walked in? It is for you too if you will choose to serve Jesus! You can not out-sin the grace of God, because you are not saved by your own righteousness, but the righteousness of God saves. How many murderers are there in the Bible? Look it up, there are numerous. Moses – murdered the Egyptian. Those who killed the man who raped their sister and all their servants. David – murdered Uriah the Hittite. God does not want anyone to struggle under those things, He wants to set you free. 2 Corinthians 5:17 – it is of vital importance that everyone understand the importance of this verse. There are 3 baptisms and two of these can only occur AFTER you receive the first one. Every time you see someone baptized in the Scripture you see that they believed and were baptized, not the other way around. The righteousness of man is futile and worthless. The sacrifice of Cain was cursed because it was of the ground. Cain was a farmer of the ground and the ground was cursed. After Adam sinned, God showed them sacrifice because there had been no death until this point. We die because the wages of sin is death. We are saved by grace because we are sinners. We need eternal life because we’re going to die. Flesh and blood does not inherit the Kingdom of God, that’s why this body has to die. God the Father washes your soul in the blood of His son Jesus Christ because it has been tied to your nasty flesh and needs to be cleansed. The sword of the Lord falls and separates the flesh from the soul and places the soul into Jesus Christ where your soul is hid in Christ. Jesus takes your spirit and baptizes your spirit into His Spirit and now you are a new creature in Christ. Your soul and spirit are new in Christ and hid in Christ, your old man – the flesh – is separated from the soul and spirit and you learn to lean on Christ and not lean unto your own understanding or your own ways. When God gave us free will, He recognized we would choose to exercise our free will in the most stupid of ways. God didn’t die for the godly because there weren’t any of them. He died for the ungodly which means for all of us. The righteousness of God commendeth His love toward us that while we were yet sinners Christ died for us. He decided to die for us before He even created us. Grace abounded unto many – it covers ALL sin ALL the time. Because of the grace of God we get to choose by our free will to go and serve God in heaven. There is a story of a woman who was a believer in the protestant reformation who was greatly abused by her husband. He was sentenced to death for his crimes. There was a law that someone could die in your place if they so chose, and his wife chose to lay down her life for the sake of her husband and it was that act of love that led her husband to believe on Jesus. When God gives a gift we should choose to receive it with thanksgiving, not try to pay for the gift. The fact that you can DO something good does not make you good. You can do NO good thing but by God. Therefore there’s no boasting in it. Enter into His rest and He can accomplish anything. Don’t ever take the good things God did for you as being somehow about you and your worthiness. It’s a testimony of Him, not of you. Every single thing is about His provision for us, there is nothing that is our provision for Christ. We come in with nothing and He provides EVERYTHING we need to serve Him! The entire work of salvation is of God not of man. Many people ask “If there is a God, why do bad things happen to good people?”, the answer is simple, there are NO good people! Even Christ Himself when he was called “good master” said “there is none good but one, that is, God”. Jesus Christ is not the God of this world, Satan is the ruler of this world and that’s why the world looks nasty. People all around the world fear all sorts of things for all sorts of reasons. God is not to blame for all the bad things in the world. Man has a free will to choose and suffer the consequences of their actions. Jesus wants people to choose Him willingly, of their own free will. What makes you a Christian is believing on His Word and doing His works. Faith is the substance of things hoped for and the evidence of things not seen, this is where people struggle to believe. Learn to love with His Love and then we can stand with Him in eternity. Jesus is there and when we cry out to Him He answers, He heals and delivers completely. If we let God arise, more things around us would look more God-like and not so man-like. Out of love for us, God gave everyone a free will. Courage and love comes from a loving God where all things are possible. People don’t have a love by nature that would care for people, let alone their enemies, they do not have a love that would bind up their wounds to help them heal. It was God’s plan to have Jesus sacrificed on the cross for the reconciliation of all those who will receive it. It is available to ANYONE who will receive. It takes a lot more courage to stand against what everyone else is saying than it does to yield to it. The majority of the population claim to be Christians and yet the character of Christ is falsely portrayed, where the rest of the people want nothing to do with Christ because of that false portrayal of Christ. God is love, Christianity today is not. God gives us spiritual prayer called tongues with which we can pray and it is a language of the Spirit. It’s a communication between our spirit and the Lord. If those who call themselves Christians aren’t doing things in the love of God then those things they are doing mean absolutely nothing! God gives man a free will, nobody has to accept His free gift. God is not a God afar off who cannot be reached nor pleased, He is here and can be reached and pleased. God created us to have fellowship with Him! We have five senses in our spirit, as in our flesh. God created a perfect world where there was no sin, but He knew we would exercise our free will and create problems. He has given us a place where we can make as many mistakes as we need to in order to get it right, learning how to love with His love, and know His way is the only right way. The Bible has two rules, and it shows us how they work. If we are following those two rules there would be no fights. Our old man is contrary to God, so He made a plan that would allow us to partake of every good thing in His kingdom by His power, because we cannot do it without Him. Jesus was born fully a man, born of a woman, but His father was the Holy Spirit and did not carry the sin of Adam. Which allowed Him to walk this earth sinless. He was able to take ALL sin on Himself and be hung on a tree that we can be free from sin and reconciled unto God. If we get grafted back into the body of Christ in this life, we can live eternally with Him. It is there for everyone who will receive no matter what obstacle we might see, God can overcome them. By our mouths we confess and believe in our hearts. We can confess words all day long and it means nothing but we cannot fake believing in our heart. Most people think they are Christians, think they have asked Him into their heart, but they don’t have an understanding of what that means. The Lord is a personal God and wants a relationship with each individual personally. It is by grace the universe is held together. Through the three baptisms we are hid and protected in His body from the sin of the flesh. And made able to walk in the power of God, His word is true. Most people that say they are of Him, have not charity and are none of His. As a servant of Christ we should be available as He is.